– for thematic elements and some violent images. In 2009, acclaimed indie film director Wes Anderson translated his quirky, stylized filmmaking to the world of stop motion animation. Fantastic Mr. Fox lived up to its name and easily became my favorite in Anderson’s catalog of movies. The filmmaker’s style is often defined by centering everything in a given frame, symmetrical imagery, and slow–and sometimes awkward–character movements. All of his movies have a bit of a surreal feel to them, with his style being quite an acquired taste. But with all of its oddities, Fantastic Mr. Fox may be the filmmaker’s most accessible film of his career, and while his newest film–and second stop-motion venture–Isle of Dogs, may not overthrow Fox in that regard, it’s amazingly artful, moving, and entertaining piece of animation. Isle of Dogs is pure Wes Anderson from start to finish. The film is even preceded by a tongue-in-cheek note to the viewer that the Japanese characters would speak in their native tongue, only to be translated on occasion by a vocal translator on screen or some other electronic device. It then goes on to add that all of the dogs’ speech has been translated into English. 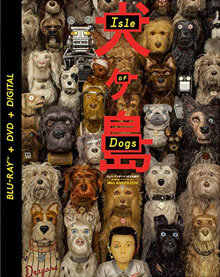 Mr. Fox had taken place primarily from the point of view of the animals, and this time around, Isle of Dogs is more so told from the perspective of the Japanese humans in the story. The character design from Mr. Fox is largely continued into this film, feeling as if this could possibly exist in the same world as that film. The basic plot of Isle of Dogs is that the mayor of Megasaki City decides to exile all dog following an outbreak of dog flu and other dog diseases. They’re sent to Trash Island to fend for themselves and live off the garbage that the city people dump there. It isn’t until the “distant nephew” of the mayor, Atari, crashes a small plane on Trash Island that things start to turn around for the canines. The core dog cast is voiced by some real, standout voice talent. Joining Bryan Cranston’s Chief is Edward Norton as Rex, Bob Balaban as King, Bill Murray as Boss, and Jeff Goldblum as Duke. While Murray was also in Mr. Fox (as a Badger), it’s especially amusing to hear Norton and Goldblum voicing dogs here. The entire voice cast is superb, and they really bring a lot to the film. But it’s near impossible to watch the film and not marvel at how they accomplished the animation. Fantastic Mr. Fox was a true marvel, with its bright and vivid color palette, and Isle is a stark contrast with its darker and more drab tones — especially while on Trash Island. But the film uses the lovable personalities of the core dog cast–and the human Atari–to brighten up the screen. The details in the sets in this film are truly amazing. 240 different sets were created by hand for Isle of Dogs, and it offers a lot for the eyes to behold and take in in each frame. As Atari makes his way through Trash Island, he travels through different trash-themed areas–like stacks of glass bottles or newspaper or TV parts–and knowing animators crafted each one by hand makes each eyefull of Isle of Dogs even more impressive and intriguing. Fantastic Mr. Fox was the first film by Anderson to not be rated R, and while it isn’t the lightest PG rated film you’ll see, it was much more family friendly than Anderson has been accustomed to making. But this time around, Isle of Dogs falls under the PG-13 banner, and rightfully so. It’s a lot edgier than Mr. Fox, and even includes some mild language and violence. One instance has Chief shouting a use of “S.O.B.” and later using just “b*tch” to refer to a female dog, but both are most likely meant to be somewhat tongue-in-cheek due to the cast being made up of mostly dogs. Some of the violence includes Atari’s plane crash, which leaves him a little bloodied and with a piece of the plane stuck in his head. He pulls it out at one point and we see a little blood squirt out before he passes out. We then later see it in his head again, though. Near the end of the film, we see a fairly graphic aerial view of a kidney transplant surgery that shows the holes cut on either side of the patients, followed by the kidney being removed and inserted into the second character and then the doctors sewing up the wounds. It’s a fairly long scene and it’s surprising to see it shown here. Other moments include dogs getting mauled a bit and beat up, with Chief biting the ear off another dog at one point (with some bloody results). Overall, I’d say the film rightfully earned its PG-13 rating, and I wouldn’t recommend it for younger viewers. For Anderson’s second foray into stop motion animation, Isle of Dogs is a triumph. It’s moving, entertaining, original, unpredictable, and just a wonderful story. I did feel that it didn’t need to be as edgy as it was at times (especially showing a complete kidney transplant surgery via stop motion animation), but it’s possible Anderson realizes these types of films are more adult in nature regardless of the fact that they’re animated. Still, Isle of Dogs could have been a family venture–as its homage to dogs and the human bond with them is apparent here and something all ages can relate to–so it feels like a bit of a missed opportunity. In the end though, Anderson fans won’t want to miss it, while those who enjoyed Fantastic Mr. Fox or have an appreciation for the incredible art of stop motion animation won’t want to miss out on a memorable trip to the Isle of Dogs. Promotional Fearurettes: – Sadly, no exclusive featurettes were made just for the video release. All featurettes were created ahead of the film’s theatrical release and serve as ads for the film. Still, they offer some great content and are each worth watching. Animators (3:42) – 27 animators and 10 assistants worked on this film! It’s incredible to see some behind the scenes footage of them working on these large sets and we see some time lapse footage of characters being animated with the animators adjusting them. Puppets (4:03) focuses on the various puppets made for the film, how they were actually constructed, the different face pieces used, and more. We get to see some being animated in person, and learn little interesting facts like how Tracy has 297 freckles on her face that are hand painted — for each head they made for her! Weather and Elements (3:04) continues the previous featurette, talking about set building, but it also focuses on the effects they made – like weather, smoke and storms. We also learn that roughly 240 sets had been built for this film — even if they were only to be seen on screen for a couple seconds! Gallery (1:18) – This is a small gallery of promo photos that can be viewed as a slideshow with 5 seconds for each photo, or manually (where you choose when to move to the next photo). The photos are mostly pictures of the voice cast posing with the figures of their characters. Theatrical Trailer – the theatrical trailer is the last Extra to round out the bonus features. Blood/Gore: We see a painting of a man’s head being sliced off with a sword, with some resultant blood; Pieces of fruit and a chair are thrown at a person. He has what looks like a speck of blood on his head from this; Two packs of dogs fight over food and one rips the ear off another. We then see it close up briefly before a dog kicks it. A couple rats then carry it off; Chief is always seen with a place on his chest where fur is missing and he has a scar; Chief declares that the other dogs make him sick and then we see him throw up; Atari is beaten up and bruised after the crash. He clearly has a piece of the plane stuck in through his helmet into his head. He pulls it out and we briefly see some blood squirt out. He then falls over, passed out; Atari has a black eye and some blood on the side of his head and speckled on his cheek; We see bones in a cage of a dog that apparently couldn’t get out; Chief has a bitten ear and a swollen face and eye after a fight. The other dogs nurse some wounds as well; We briefly see Atari’s bruised and discolored foot as he puts on a sock; We see some food being prepared, including a live fish being sliced up for sushi, then a live crab opened up and guts removed. We then see a tentacle that is still moving be cut up and served; We see a dead body lying on a table with disturbingly wide eyes before a sheet is pulled up over him; In a short scene, we see Atari in just his underwear and he has scrapes all over him, presumably from the plane crash; A dog is seen with half of his face not having any fur on it and one of his eyes being discolored; We see a bunch of dogs with scars and wounds; We briefly see through the top layer of the dog’s skin to see all of its organs and veins as medicine is shown moving through its veins; After a brawl, another piece of debris is shown sticking out of the other side of Atari’s head with a little blood; A dog is shown lying unconscious and apparently missing an eye. We later see it with a bloody patch over its eye; We see some blood on a doctor’s uniform; We see a long and graphic kidney transplant surgery. It’s an aerial view of the surgery where we see two patients draped with a blanket and part of it open where the person is being operated on (including the gaping opening on both patients). The kidney is then shown being removed and carried to the recipient and the wounds being sewn up; Like before, we see through the skin of Atari and see his organs and veins. We soon see this again for another dog. Violence: We see a painting of a man’s head being sliced off with a sword, with some resultant blood; We see some drawings of diseased looking dogs; Pieces of fruit and a chair are thrown at a person. He has what looks like a speck of blood on his head from this; The dogs cut open a bag and we see a pile of rotten food with maggots squirming around on top. Two packs of dogs fight over it and one rips the ear off another. We then see it close up briefly before a dog kicks it. A couple rats then carry it off; We see a small plane crash on the island; Atari is beaten up and bruised after the crash. He clearly has a piece of the plane stuck in through his helmet into his head. He pulls it out and we briefly see some blood squirt out. He then falls over, passed out; Atari has a black eye and some blood on the side of his head and speckled on his cheek; We see a pair of sumo wrestlers fighting; We see bones in a cage of a dog that apparently couldn’t get out; We see a flashback of Atari in the hospital in a full body cast; The dogs are shot with paintball guns by a large drone. Atari hits it with rocks and pieces of metal via a slingshot. The drone catches on fire and blows up. The dogs beat up the captors. Chief fights a robot dog and all of the dogs come away from the fight with injuries; Tracy throws an eraser at a teachers head and it bounces off of him; Chief tells a somewhat violent story from his past where he bit a person out of fear; We see a dead body lying on a table with disturbingly wide eyes before a sheet is pulled up over him; A dog shoots teeth that are actually explosives and they blow up robot dogs; Tracy smashes a glass while arguing with a person and gets up in Yoko’s face while yelling at her and then throws another glass; We briefly see through the top layer of the dog’s skin to see all of its organs and veins as medicine is shown moving through its veins; As a poem is read, we see a vision of a volcano going off and people turning into skeletons; There’s a big fight that breaks out on stage between dogs and humans and robot dogs. We see that another thing is stuck in the other side of Atari’s head; Some drones explode; A dog is shown lying unconscious and apparently missing an eye; We see a long and graphic kidney transplant surgery. It’s an aerial view of the surgery where we see two patients draped with a blanket and part of it open where the person is being operated on (including the gaping opening on both patients). The kidney is then shown being removed and carried to the recipient and the wounds being sewn up; Like before, we see through the skin of Atari and see his organs and veins. We soon see this again for another dog.